Employee Survey? Yes, Just Do It! Employee surveys used to be complicated and expensive to implement. Not anymore. Because it was expensive, if a company implemented a survey they would often ask many questions – hoping to gather as much info as they could for their financial investment. With such an investment, writing the questions was often a long, drawn-out and political chore… and responding to them was equally unpleasant. Times have changed – thankfully. I just received a 2-question survey from my grocery chain. Did I answer it? Absolutely – without much thought. I didn’t even hesitate at the 10 second commitment. While my graphic isn’t an employee survey, it is a great example of how surveys can be simplified and encourage participation. Implementing employee surveys today is much more affordable. And, there are a number of reliable software service providers which provide flexible branding and result collection options. Thankfully this has made surveys more accessible and organizations are being more targeted with their research. Today the difficult part remains writing strategic, relevant survey questions. This is where the time and financial investment still needs to be applied which for organizations means getting the assistance of third parties (e.g., BMC). Like with most things, knowing what you want to achieve is your best first step. Get feedback on a new procedure. Explore creative ideas your sales or front-line employees have. Conduct a management-level 360 review. Help employees be reflective of their behaviour – good and not so good. Get employees ‘in the mood’ for the training you are going to do. Remind employees of the training they’ve had. While surveys are versatile, be careful to keep your objective simple – and if you can, keep your surveys to one topic. I recently wrote and launched an pre-training employee survey for a workshop I was hired to design and facilitate. Because the survey results were only seen by me, the employees were very confident to answer honestly. The results from the pre-training employee survey gave me valuable insight on how to position the professional development training; I was able to customize the training to meet specific needs. During the training workshops I was able to knowingly ‘lean into’ certain areas where I knew they would benefit the most. The results also helped me congratulate them (positive reinforcement works), on behaviour they were doing. It also meant I didn’t bore them by hammering home best practices that they were already doing. Employee surveys can have huge benefit. Be up-front with staff about how important the survey is. When you conduct a survey in the workplace, you are sending a message to employees that you value their suggestions, ideas and creativity. Don’t assume employees know this – be sure you say it. Explain you are genuinely interested in getting their input to improve them and/or the organization. Ask them to be open and honest – and if they might feel at risk in answering (which is normal), make sure the survey is anonymous. Anonymous surveys often help gain honest feedback. Employee surveys have the advantage of building employee morale. Employees will see first-hand they have a say in the training they receive, how the business operates, and even some of the policies moving forward; this often leads to increased loyalty and decreased turnover. Be up-front with staff about how important the survey is to you. If they have one – work with the HR department. Explain to your audience that you are genuinely interested in getting their input. Ask them to be candid in their feedback and assure them that responses are anonymous (suggestion). Finally, commit to putting the survey results to work. Employees will embrace change that they feel they have contributed to. Know what your response deadline is. Whether it is the date you cut-off additional responses or the date you push / encourage your audience to respond by. Manage everyone’s expectations including your own and share your response deadline. Know who’s responding. If you are doing an employee survey it is often helpful to get a sense of the experience level with the company and/or position of the person responding. Often that can be achieved by adding one question for each. One advantage of an anonymous survey is that you can get honest and insightful feedback about topics employees might not be comfortable bringing to you in person. Uncovering challenges employees are experiencing may keep valuable employees from looking work elsewhere – like your competitors – an expensive loss from many different angles. Happy communicating and survey design. April 8, 2015 is a Day of Pink, when people around the world are encouraged to wear pink. The idea of a pink day is to celebrate diversity and show support for those who are (or have been) bullied or who have felt discrimination. 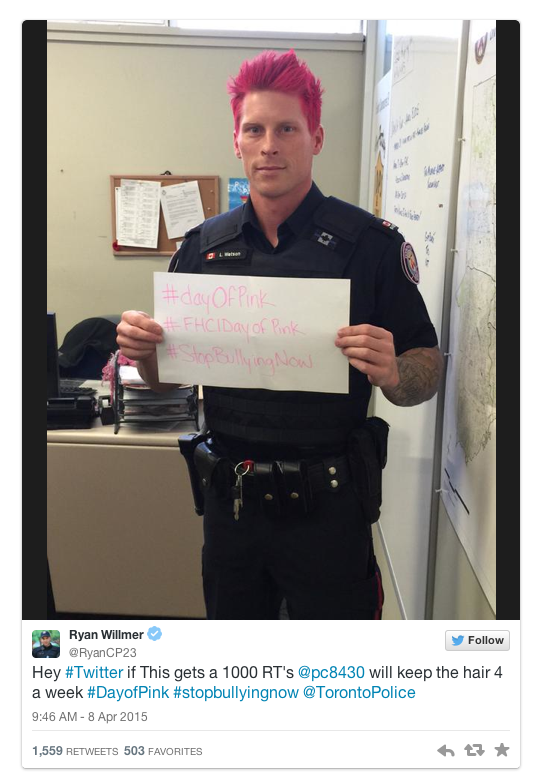 Demonstrating that telling an effective story doesn’t need to be complex or expensive, one Toronto police officer dyed his hair pink, with a pledge to keep his hair pink for a week if his post was re-tweeted 1,000 times. The campaign started off small, where in advance of April 8 he tweeted out that if he received 200 retweets he would colour his hair pink. We can be happy that Officer Watson (PC8430), reached his 200 retweet goal. The next request was for 500 retweets. If he reached that goal he would post pictures of his pink hair. Thankfully he reached that goal as well. On the morning of April 8, and with much fanfare PC8430 dyed his hair pink… and the news channels and social media took off. Officer Watson put out a pledge that he would keep his hair pink for a week if his post was re-tweeted 1,000 times. His post was re-tweeted – even by Toronto Mayor John Tory (a personal thumbs up to the police officer, the police department and Mayor Tory). At the time of this post the photo has far exceeded its 1,000 retweet request and has attracted attention from radio, TV, newspaper and of course social media proving business stories can be simple and effective. For example, this Toronto story was just picked up the New York Daily News. Bruce Mayhew Consulting facilitates courses including Email Etiquette, Time Management, Multigenerational Communication and Mindfulness. 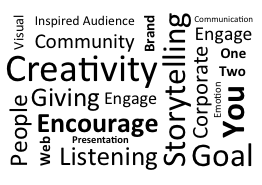 Whether your business stories are for your website, your presentation at your AGM or for an important client proposal, knowing how to make your business stories live is crucial to engaging your audience, empowering your employees and helping your brand soar. But if you’ve tried telling business stories you know creating the right balance isn’t easy. Staying away from corporate jargon and getting the right combination of emotion and fact is tough. What are the events that frame the main theme or purpose? What is the struggle, vulnerability or conflict the main character experiences? How was the main struggle overcome or diminished and what parts did everyone play? A huge client request that you rose to? An important delivery that was stuck in a snowstorm? Great stories let the listener believe what you are saying and should engage their empathy. Your audience should be able to relate to your story or at least imagine what it might be like to have been faced with the feelings of conflict, happiness, sadness and/or pride. Help your audience remember your story for days/weeks and hopefully months later by tapping into their own powerful emotions. And then (in most cases), help your audience take one more step – the step of compassion and a desire to act – to do something. I find business stories are best when told in either first person or third person. First person means that one of the characters in the story is telling/recounting the story. Third person means that the person telling the story is not part of the story – they are an observer. Stories are almost always best when written with short sentences, common language and short paragraphs. 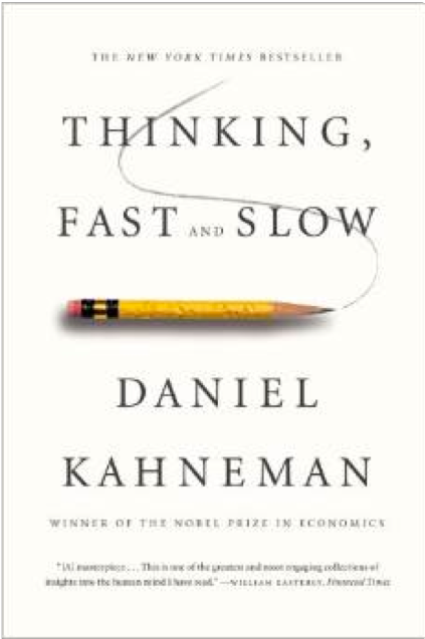 The longer and more complex everything is, the more work the audience needs to do when listening/reading; and you don’t want them to work… you want them to feel. Especially if your audience is outside or new to your business, avoid jargon and acronyms as much as possible. Even be careful with things like program names, which can easily be different from one business or one industry to another. You can see there’s a lot involved in putting together a great business story. Great stories grab your audience with your opening and holds onto them the whole time. Every part of the business story should keep your audience emotionally invested in the main character, plot and solution. Remember, dull statistics will almost always serve as a distraction. Happy communicating and business story writing. Thank you! From the beginning of time stories have helped people teach, learn and share values. Great stories make ideas come alive and events memorable. Great stories also trigger a wide range of emotional responses (from confidence and respect to fear and anger), which actually help listeners and/or readers visualize an experience. Because your stories are alive, treat them like gold. Great stories are more than just words on a page, use stories to sell because great stories can almost appear 3-dimensional… far more memorable than listening to a list of features and benefits. Great stories help us learn, explore and relate to the information being shared. Great stories – especially great business stories can do anything from describing a need, to a challenging situation to a resolution… and so much more. And, in addition to describing or solving a practical situation, great stories very often also satisfy an emotional need (even if it is subtle), in your listeners and/or readers. It’s important you pay attention to this as you build/draft/share you story because this emotional need is part of what makes great stories so memorable. By addressing the corporate needs and (perhaps subtly), addressing the individual needs, your story may be just the thing required to lock in a big new customer. Therefore, when you look at great business stories for your company – be sure to include stories about emotional successes as well as how you are able to increase production and/or reduce expenses. 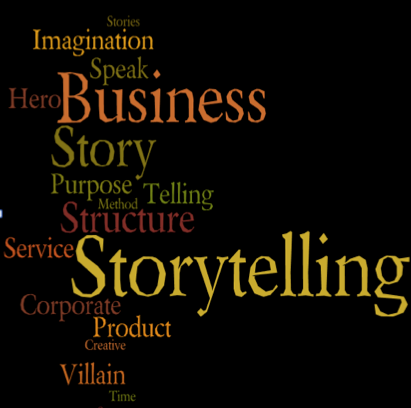 Stories are a living asset that sales people and everyone else at your company can use to make interpersonal connection with whomever they are speaking with or writing to to build your brand, build pride and build relationships. So, have a library of great stories ready and share them your sales people, your employees, your suppliers… and anyone else you can think of. Happy Selling And Story Telling. Story telling is one of the most effective ways to make a connection. Telling business stories can help people consider new possibilities, broaden their knowledge, think outside the box… and therefore deepen their understanding. When you tell a story (vs. listing product facts and specifics that most of us are really good at ignoring), you have an opportunity to develop report and build relationships as you demonstrate your unique talents / abilities and therefore establish you as a trusted partner / expert. Especially if your business is selling, you want to tell stories that will create memories; especially if you can entertain and engage your audience. And, when your business stories are remembered they will sell your services for you (word of mouth), for days, months and even years down the road. Mix it up. Try to add as much diversity to your story portfolio as possible. Every story adds to the quilt of understanding. Example: You don’t only drink Coke ® at a picnic. So, Coke commercials show people enjoying the soft drink in many different times, places – at work and at play. 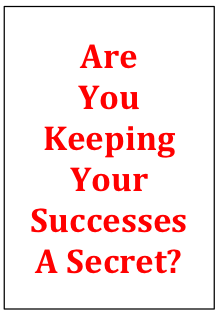 Know what you want to achieve – what is your one goal? To reach that goal, what is the gap you have to close that will benefit your customer? Is it awareness? Is it safety? Is it decreased risk or cost? Helping your customer achieve their goal will help you achieve your business goal. Their job isn’t to buy your product / service; they have a need and you have to show them how your product / service will improve their situation. If you start by introducing lots of background information before you get to the problem and solution, your audience will move on before you get to your important message. Instead, bottom-line your message. 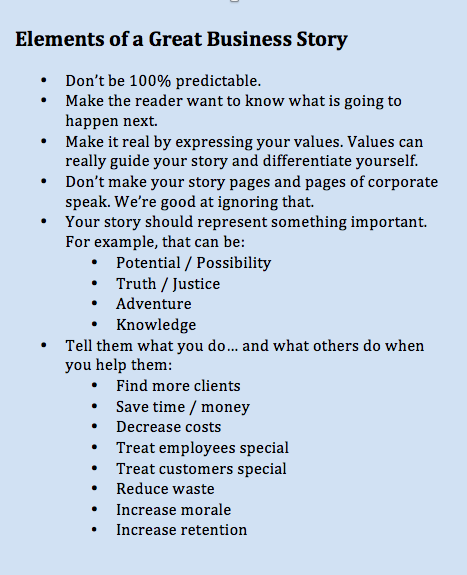 Tell / show them why your business story is interesting – then they will stay with you and listen attentively as you establish appropriate background. Use your stories everywhere: online, in print and in video. Post your stories on your website homepage, in presentation decks and sales collateral / proposals, letters / brochures, even build commercials around stories. Use the feedback you receive from clients, suppliers, consumer rating services – even competitors and create business stories. There is no source of positive information that should be overlooked – just judge your source respectfully and appropriately based on your audience. Coke is the registered trademark of The Coca-Cola Company in the United States. Not too many years ago employees stayed with companies for years… and they accepted that a combination of hierarchy and seniority determined most decisions. But things are different today: at the ready is a multicultural and multigenerational workforce that wants to contribute in a team environment. For companies that embrace this diversity in the workplace, there are many short and long-term strategic advantages. One of the most obvious is that this workforce also reflects the multicultural and multigenerational nature (needs / wants), of your suppliers and clients. One of the first things companies have to develop is a plan to attract, keep and motivate top employees from all generations (Traditional Generation or Silent Generation, Baby Boomers, Gen X and Millennials), and cultures. That means companies have to offer top employees more than high pay (the motivator of the young American Baby Boomer). Work / life balance and career / personal development are important for most people in today’s job market. Even the average (now mature), American Baby Boomer is looking to enjoy life, family, and explore a dream or two as they near retirement or begin post-retirement careers. What’s the solution? Excellent question. The answer is as diverse as your workforce and company – but here are two suggestions. Just remember that people will feel empowered and engaged when they have a choice. Paid time off is an excellent solution. Paid time off benefits Baby Boomers who might want to explore a dream or conduct specialized research. Paid time off also benefits Gen X and Millennials (Gen Y), who want to develop additional skills. In both cases the company is also likely to benefit when their (very happy), employee returns. Before you disregard this option as too expensive, calculate how much employee turnover costs. The average is 1.5 times their salary to search, hire and train middle level employees and up to 4 times their salary for specialized or senior employees… not to mention the less than exceptional performance you might experience while your unhappy employee is searching for a new job. Consider working with employees wanting paid time off to create a mutually beneficial solution. A discussion makes them part of the solution and gives them choice. People take ownership and learn better when they are part of the learning process. So, establish a one-on-one or group peer mentoring program with people from different generations and different cultures. Within this program, establish this is an environment where learning about each other is one of the primary goals. Experienced Baby Boomers coach Millennials (Gen Y), on ‘company history and culture’ and traditional business best-practices. Gen X and Millennials introduce Boomers and members of the Traditional Generation or Silent Generation to new technology and coach how to use it. All employees have a chance to be creative in a safe – respected space. Employees from different cultures and generations can openly explore how they ‘feel’ about possible decisions in a safe – respected space. The important part is to communicate openly so you can share and explore decisions made based on each other’s cultural, experiential and generational ‘nature’. No matter what solution you implement your multicultural and multigenerational workforce will benefit from a coach to co-establish objective and processes. A coach will also be able to teach them how to communicate and how to listen (note: this is not a plug – I am a corporate trainer not a coach). A coach can also help individuals or teams recognize their many similarities (see the following examples). These are important because similarities will help ground the individual / team. * This doesn’t mean every person wants the same or rates them in the same order. People from different generations and different cultures are transforming office life. 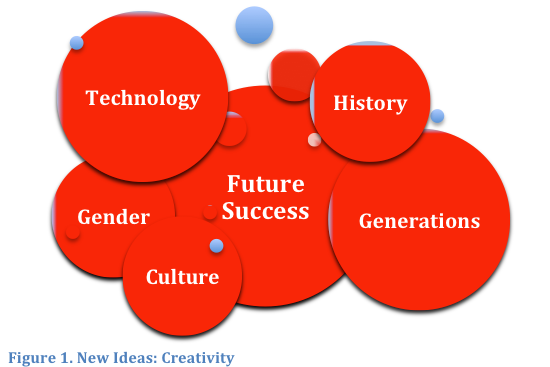 When people with different backgrounds cooperate, creativity and innovation happens. The result from this diversity in the workplace is that people learn how to communicate and generate ideas that usually creates high-impact change with low economic and emotional risk and high economic and emotional gain. Fantastic! I was recently asked ‘What is empathy?’ and ‘How might empathy at work impact business and business communication?’ They are great questions so I thought I would explore them here with you. Empathy is the ability to ‘imagine’ what it would be like to experience what another person is experiencing. Empathic people are intuitive and often sense the unspoken needs, emotions or tensions of people. That said, it doesn’t mean empathic people agree with what they are sensing. Empathic people often have terrific people skills and enjoy working with and helping people. In these cases an empathetic person becomes a knight in shining armour – coming to the rescue. While empathy is a valuable business communication (or parenting), asset – it can also be a business challenge. It’s important for employees to always realize it’s important to care for the integrity of the business (brand, quality and reputation), while they support its customers / suppliers / employees. Therefore the empathic employee must look for the immediate value as well as the long-term value of all sides of every relationship. Empathy is sometimes seen as a weakness – an opportunity to take advantage of the caring person or company. While the manipulation of anyone is possible, there’s no good reason to isolate empathy as a character weakness. The reality is that many great leaders have great empathic skills. Empathy is an asset because it allows great leaders to accurately motivate staff to perform in a way that satisfies both company and individual (staff and leader), objectives. After reading Steve Jobs biography I expect he was quite empathetic (he always seemed to know what someones wants / needs were). But Steve Jobs had virtually no compassion for people so was often hard on those around him (family being a wavering exception). On the flip side, Steve seems to have had much compassion for the products he was involved in building and the customers (as a mass market), he was ‘helping’. Many strong, empathic people are aware of the symbiotic relationship between other related character traits. For example, important to empathy are core competency (a person’s ability to do their job), values and job satisfaction. Compassion (or caring), is also important because compassion can motivate the empathic person to take action and to use their people skills. A person who says “I see” or “Tell me more about that” is demonstrating they care for what the other person is feeling, knowing and / or experiencing. If the other person doesn’t feel sincerity it’s likely they will not be as open as they could or would like to be. Bob is a carpenter who is proud of the decks he builds and personally designs them to meet the needs of his clients. His empathy and compassion help him focus on things competitors overlook or don’t care about (for example making sure clients can’t trip when entering the house from their deck). Bob has decided to get a part-time job and finds one at a hardware store; the fit seems complementary. During his shift there is a constant flow of homeowners who ask questions related to building their own decks. When Bob gives the customers advise they often ask for short cuts. It doesn’t take long before his boss notices Bob is visibly frustrated and raises this as a customer service issue. Bob is still an empathic person but he is also proud of his ability (core competency), and his finished product. The challenge is that because many customers are looking for short cuts he feels he and his profession are not being respected. Certainly some changes need to be made if Bob is to remain a valuable employee – and lets face it – he has great value. There are many possible solutions… for example Bob may be better suited to be a special support representative for other contractors or to give demonstration classes. Mrs. Smith calls your Customer Service Hotline after receiving a book she ordered online for her husband as a birthday gift. She realizes she mistakenly ordered the wrong issue but your company is now sold-out of the issue she needs. “That’s unfortunate Mrs. Smith. We are sold-out of that issue and not expecting stock for 1 month. ”That’s unfortunate Mrs. Smith. We are sold-out of that issue and not expecting stock for 1 month. May I suggest a book from the author XYZ – I see that people who have been reading ABC have quite enjoyed this new author. I can have XYZ’s best selling book to you in two days and it might give your husband a new favourite author. We can also pre-order the volume you wanted which means your husband will have another surprise in a month. What happened here was that the book wasn’t the problem. The problem was she didn’t have a birthday gift for her husband… and that she had made a mistake. But being empathetic and having compassion for Mrs. Smiths situation enabled you to resolve her problem, secure an additional sale and likely – create a customer for life that will positively tell other people about your brand and company. By using empathy and knowing how to be compassionate within your business communication you can often quickly get to what happened and explore why. Customer service, customer retention and employee job satisfaction will also soar. You may find that ‘the situation’ is often just a symptom of another business issue… so if we can work with the customer to uncover the other issue we can often find a better solution to a much different problem… easily. What Are Good Careers For Empathic People?